I have always heard that only 30 percent of kids brought up in the church will remain steadfast in the faith as adults. In other words, as many as 70 percent of children growing up in a Christian home will leave the faith when they reach college age (although some will eventually return). This is not surprising when I consider all of the kids I grew up with in church: many friends who, at one point walked an aisle and prayed a prayer; now as adults, demonstrate very little if any interest in the things of God. These numbers should both alarm us and bolster our commitment to disciple our children. I recently received an encouraging email from one of our church members whose daughter brought a friend to visit our student ministry. After church, the visiting teen remarked that she enjoyed her time at our church. When asked why, she said that her youth group rarely used much Scripture. Interestingly enough, this anecdotal story seems to confirm the results of a recent national study. Lifeway researchers surveyed 2,000 Protestant and non-denominational churchgoers who attend church at least once a month and have adult children ages 18 to 30. The goal of the project was to discover what parenting practices were common in the families where young adults remained in the faith. The results are somewhat surprising! On the one hand, certain things that one might expect to be a major contributor to the perseverance of a young person’s faith were absent from the list—things like attending worship services, attending private Christian schools, or regular family meals. It was also surprising that some of the most labor-intensive church “programs” for young people—Vacation Bible Schools and attending youth group—were not highly predictive of spiritual health on their own UNLESS they were linked to the key core principles of reading the Bible and serving! 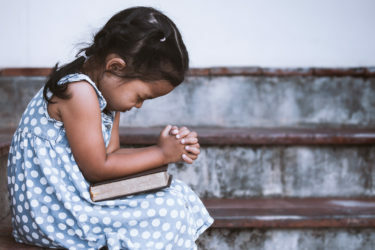 On the other hand, one might be surprised to find that it was the regular normative Christian practices that had the most impact on a child’s moral and spiritual development and were the best predictors of spiritual health that persists into adulthood. Turn the page and walk with me through those childhood factors that are the best predictors of spiritual health in young adults. There are several things we can learn from the results of a recent LifeWay Research survey. As the people of God, the lifelong spiritual health of our children is not forged in gimmicks and fads. As the research shows, the most formative aspects of a lifelong faith are the normative Christian practices that have been common in the church throughout history. It is long obedience in the same direction that helps keep children on the path of faith well into adulthood. Encourage your children to read their Bibles throughout the week! Find ways for them to serve in the church. Take part in service projects or mission trips as a family. Teach them the songs of faith that will carry them through the different seasons of life! True, it is God who brings the growth. But tilling the soil and planting good seeds is our greatest responsibility to the next generation. The most formative practice is BIBLE READING! Children who regularly dwell in the Word of God have a greater chance of continuing to walk with God throughout their lives. The writer of Hebrews reminds us: “…the word of God is living and effective and sharper than any double-edged sword, penetrating as far as the separation of soul and spirit, joints, and marrow” (Hebrews 4:12, CSB). Regular Bible reading plants the word deeply into their hearts, and it continues to dwell in them richly (Colossians 3:16, CSB). Second on the list was PRAYER. A child who regularly communes with God in prayer is more likely to walk in close fellowship with God as they grow older. When Jesus said, “Let the little children come to me,” He meant it. Their vocabulary may be limited, but our children have unlimited access to God through Jesus Christ and should be reminded that in Christ, not only do they have the confidence to approach God in prayer, but that He also hears them (1 John 5:14, CSB). The fourth factor contributing to the spiritual well being of young adults is that they grew up listening to Christian music. We should exhort our children like the Apostle Paul did in Colossians 3:16 (CSB), to sing “…psalms and hymns and spiritual songs.” How many of us can remember the songs we learned as children? The Christian songs we sing have a powerful way of embedding the truths they espouse in our minds as truth. The third and fifth most important predictors of spiritual health were related to SERVICE! Specifically serving in the church & serving on mission in the world. This is an important reminder that our children are part of the body of Christ that Paul describes in Ephesians 4. Not only has God gifted our kids to serve, God has also called us to equip them for the work of the ministry. If our children are truly part of the body of Christ, they should have the opportunity to function as a part of the church on mission. These experiences and exposure to the love of Christ in action are an important element in producing an enduring faith in our children. Think your kids are too old to take advantage of some of these ideas? Think again! Go on a service project, study the Bible with them, pray with them, and worship with them. It’s never too early, it’s never too late! Matt serves as the Sr. Pastor of Fairview Baptist Church in Apex, NC. He has written and contributed to several books, served on the Leadership Council for the ERLC of the Southern Baptist Convention, and is on the Board of Directors for the Baptist State Convention of NC. Matt worked for two years on The Gospel Project at LifeWay Christian Resources.